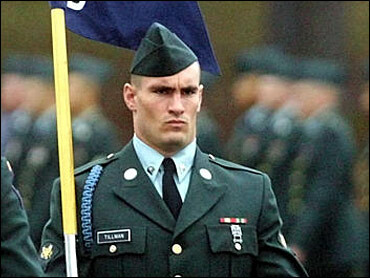 As bullets flew above their heads, the young soldier at Pat Tillman's side started praying. "I thought I was praying to myself, but I guess he heard me," Sgt. Bryan O'Neal recalled in an interview Saturday with The Associated Press. "He said something like, 'Hey, O'Neal, why are you praying? God can't help us now.'" Tillman's intent, O'Neal said, was to "more or less put my mind straight about what was going on at the moment." "He said, 'I've got an idea to help get us out of this,'" said O'Neal, who was an 18-year-old Army Ranger in Tillman's unit when the former NFL player was killed by friendly fire in Afghanistan in April 2004. O'Neal said Tillman, a corporal, threw a smoke grenade to identify themselves to fellow soldiers who were firing at them. Tillman was waving his arms shouting, "Cease fire, friendlies, I am Pat (expletive) Tillman, damn it!" again and again when he was killed, O'Neal said. A chaplain who debriefed the entire unit days after Tillman's death later described this exchange to investigators conducting a criminal probe of the incident. But O'Neal strongly disputes portions of the chaplain's testimony, outlined in some 2,300 pages of transcripts released to the AP this week by the Defense Department in response to a Freedom of Information Act request. The chaplain told investigators that O'Neal said Tillman was harsh in his last moments, snapping, 'Would you shut your (expletive) mouth? God's not going to help you; you need to do something for yourself, you sniveling ..."
"He never would have called me 'sniveling,'" O'Neal said. "I don't remember ever speaking to this chaplain, and I find this characterization of Pat really upsetting. He never once degraded me. He's the only person I ever worked for who didn't degrade anyone. He wasn't that sort of person." The chaplain's name is blacked out in the documents. Tillman gave up a multimillion-dollar football contract to enlist with his brother in the Army after the 2001 terrorist attacks. The military initially told the public and the Tillman family that he had been killed by enemy fire. Only weeks later, when the truth was about to be published, did the Pentagon acknowledge that he was gunned down by fellow Rangers. The Pentagon conducted a criminal investigation and ruled that Tillman's death at the hands of his comrades was a friendly-fire accident. Congress is preparing for another hearing this week, while the Pentagon is separately preparing a new round of punishments. Soldiers and commanders who worked with Tillman have repeatedly testified that he was respected, admired and well-liked. In the same testimony, medical examiners said the bullet holes in Tillman's head were so close together that it appeared the Army Ranger was cut down by an M-16 fired from a mere 10 yards or so away. O'Neal said the shooters were "close, close enough for me to recognize them, but they sure weren't 10 yards away. They were further than that. I've thought about this plenty of times. They wouldn't have been more than 50 yards away." Another key issue raised in the transcripts involved never-before-mentioned snipers who were apparently there when the firing broke out, got out of their vehicle and walked alongside the convoy, cutting up the canyon firing. O'Neal said Saturday that he knew there were snipers in the convoy that fired at them, but that he can't remember their names. Were they fired at by the snipers? "Not that I know of," O'Neal told the AP. Q: Are you aware whether or not any U.S. forces snipers were at the scene? Scott: They were in serial two. Q: And, and do you know whose GMV (ground mobility vehicle) they were traveling in? Scott: I don't think they were in a GMV. I think they were in a cargo Humvee. Q: Okay. Do you know if the snipers fired any rounds during this incident involving CPL Tillman? Scott: I do not, no. By Martha Mendoza, Associated Press.